Italy is blessed with an extraordinary wealth of grape varietals: On the one hand, the nobles, clerics, merchants, and sailors who traveled brought home promising cuttings (for example the Vermentino that yields excellent whites in Sardegna and along the Tuscan and Ligurian coasts, and which is Spanish in origin, or the Cabernet Sauvignon that adds an extra touch to Carmignano, which was introduced to the hills above Prato in the early 1700s by Cosimo III De'Medici). And on the other, the farmers who worked the lands generation in and generation out noted the slightest variations in the vines they worked with, and with time propagated anything that seemed remotely promising, developing new varietals with time. Some of these new varietals gave quality, complementing the primary varietals -- Colorino and Mammolo, Tuscan varietals that provide color and enrich the bouquet come to mind -- and as such are still interesting today, while others gave security -- Bottaio, for example, whose name derives from botte, or cask, and suggests it could be depended upon to provide quantity, and still others were simply able to grow in steep marginal lands unsuitable for other more profitable crops. The end result of this long-term vine breeding was that the average traditional vineyard in Italy had a few primary varietals and could have any number of lesser varietals. In other words, they were hodge-podges. The development of specialized viticulture in the last century has been positive in many respects, but has also had a dreadful impact upon the diversity of Italian varietals. For two main reasons. First, when planting new specialized vineyards, rather than take the trouble of propagating what was positive from the existing vineyards, the vast majority of winemakers go to nurseries and order specific clones of specific varietals. What had been variable therefore became an entire vineyard planted to one, or just a few varietals, with a consequent loss in vineyard diversity. The second mechanism leading to diversity loss is more unexpected: The appellations themselves. Italian wine-making law gives precise compositions for Appellation wines (DOC or DOCG wines): They can be single varietal, say Nebbiolo, or a specific blend, or, if the appellation offers more leeway, from the varietals (red or white as the case may be) approved for use in the province where the appellation is made. And herein lies the catch: If the varietal is not on the Region's list, it's not legal (nor is a wine made with it) even if it has been growing on a particular hillside for 10 generations. The winemaker should (the law says) rip it all out. And the sad thing is that many winemakers, either fearing the problems a zealous bureaucrat can raise, or convinced that the old vines are worthless because the world markets demand something else, do rip them out. It's a serious loss: Local clones of the major varietals will probably be better adapted to a particular terroir than something from a nursery, while good local lesser varietals can add accents and characteristics nobody else has. 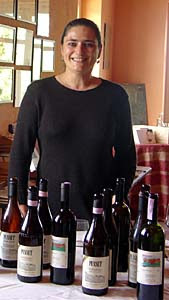 The end effect of the reduction in biodiversity is a progressive standardization of taste, and while this may be positive for large wineries that are aiming for uniform products, it's not at all positive for the small producer who is trying to produce wines with a personal touch of the sort that wine lovers eagerly seek out. Fortunately, some people are trying to buck this trend. Roberto Droandi, of the Azienda Agricola Mannucci Droandi in the Upper Valdarno (one of the four areas Cosimo III De'Medici recognized in the Bando Sopra la Dichiarazione dé Confini delle quattro Regioni Chianti, Pomino, Carmignano, e Val d'Arno di Sopra he published in 1716, the first establishment of appellations), has gathered and propagated (to date) 43 lesser varietals that were once grown in the vineyards of the area. Some are red, and others white, and he found most in vineyards owned by elderly farmers who have not modernized their lands. He has set aside a vineyard and grows enough of each for a microvinification -- in other words 50-80 kilos of grapes, enough to yield about 50 liters of wine. This is, he says, much more difficult than making wine at a larger scale, because with small volumes problems that arise proceed at much quicker rates than they do with larger volumes, and therefore the is much less time to correct them. Nor are the difficulties limited to the cellar; since nobody remembers much about these lesser varietals, he has to proceed by trial and error when it comes to vineyard management and judging when to harvest -- he has waited too long more than once, and thus ended up with badly overripe wines. The solution? Take notes and do things a little differently the next time. The ultimate goal of course is to evaluate the wines, certify the best grapes so they can be grown commercially, and continue to evaluate the rest while seeking out other forgotten varietals before they are lost. I felt quite flattered to be invited to the first presentation of the wines. They are all 2006, and all were fermented in steel, the whites at low temperatures, using selected yeasts, racked a few times to clarify them, and bottled in the spring. They are all from the 2006 vintage, and these are my notes as I took them, with asides woven in. This is from the Valdarno, and specifically Mercatale, was first mentioned in the 1850s by a Swiss who found a vine on his land. This has been written into the national catalogs, can be grown commercially. It's white, pale brassy yellow with greenish reflections and brassy highlights. Interesting bouquet slightly greenish with some butterscotch that's grape, nice acidity, hints eucalyptus. On the palate it's vinous, and quite lively, with bright acidity, fairly rich and a chewy feel to it. Nice herbal notes, more herbal than fruity. Interesting and quite promising, brings to mind a strutting bantam. They're still working on figuring out when it's best to harvest the grapes. Forgotten varietals that people have to learn how to work. A first vintage. This is from the Valdarno, and is called cascarilla because it drops berries from the bunches. It's charged greenish gold with greenish highlights. Unusual, rather medicinal bouquet with floral accents overshadowing it; with time it gains considerable almond accents that bring to mind some of the almond liqueurs of the deep south. On the palate it's medicinal, and greenish, with fairly bright grapefruit acidity; it has a lumbering quality to it. The harvest might have been a little late, though it has interesting grapefruit acidity. A first vintage. It's quite productive, and the name refers to the fact that one could fill a cask with a few vines. Pale brassy white with brassy reflections. The bouquet is interesting, quite mineral with minty accents, and considerable greenish acidity; it's a bit more aromatic, and a bit more floral. On the palate it's fairly rich, and softer than either of the other two, with lively grapefruit fruit acidity, and quite fresh. It's a bit thinner on the palate, lighter, waterier than the others. It's a good blending varietal that could contribute to a wine made primarily from another varietal, filling in voids. The reds: This is the first Lacrima they have made. They have some experience with the others. One thing: In the Valdarno some families call Sangiovese San Vicetro. This is a smaller graped Sangiovese that ripens sooner, so they used to plant it on hillsides. It's deep ruby that's not too dark, and has an elegant red berry fruit bouquet with pleasant spice and some acidity, also hints of cedar. On the palate it's pleasant, in a fairly light key, with rich fruit and fairly bracing acidity, with fairly smooth sweet tannins. Quite promising, in a fairly light key. Old style, and interesting. A well made wine of the past. A synonym of Sangiovese from the Aretino (Sangiovese is also called Calabrese in some parts of southern Italy, it turns out). Deep pigeon blood ruby with black reflections. The bouquet is spicy, with hints of cumin, and quite a bit of India ink, On the palate it's a bit medicinal, without much in the way of acidity. Fairly light. As it opens the medicinal characteristics remain on the palate, but the spices become considerably more interesting. A potentially intriguing vitigno complementare, or blending varietal. An old vine that used to be common throughout Tuscany. It's quite tardy, and quite acidic too. Hence the name, because it was tart enough to make one cry. Also very deep color, and they think that it could be a good blending wines. Impenetrable pyrope with black reflections. The bouquet is bright, with berry fruit supported by quite a bit of slightly floral acidity. Fresh. On the palate it's bright, with chewy dusty tannins and fairly rich fruit supported by fairly lively acidity. Considerable stoffa to it, chewy and leaves your teeth squeeking But it has potential. With time, the bouquet Lacrima D'Arno now smells of leaf tobacco, perhaps even pipe tobacco. It could work as a vitigno complementare, or blending varietal. This is from the Grossetano, and San Felice has just released the 2003, which they have been working with for a while. It's a close relative of Montepulciano. Poured ink, with violet rim. The bouquet is reductive, with pleasant plum and underbrush. Nice balance, and interesting. Has a feel of Montepulciano to it. On the palate it's elegant, with rich berry fruit supported by pleasant tannic structure and lively slightly sour acidity with underlying hints of graphite. Considerable potential to it, and quite nice. In the Valdarno they have always sought color, so this is a vine wine to blend into lighter wines. It's impenetrable purple poured ink. The bouquet is rich, with ripe black cherry laced with slight graphite and hints of underbrush that are the solforosa, added to put the wine in wood. Impressive. On the palate it's full, with rich cherry fruit supported bypowerful cedar-laced tannins that have an inky bitterness to them, while the acidity is relatively light. It's quite astringent, and tannic in spades. In the past they used it for the governo toscano, which it contributed to without the run away tannins. This varietal is from Massa, on the Tuscan coast. This they have enough of to bottle, and it's a cask sample. Impenetrable pyrope with black cherry rim. It's quite oaky now -- it was put in a barrique because they had that volume of wine. It's quite oaky and this is because it was just bottled and drew heavily from the cask. On the palate it's fairly rich, with mineral fruit supported by moderate acidity that flows into a clean tannic finish. The tannins are quite sweet, and it has quite a bit of potential. Tooth cleaning. Quite productive, and requires considerable pruning. It's inky purple with violet rim. The bouquet is rich, with violets and red berry fruit with some spice as well. On the palate it's elegant, with rich berry fruit supported by smooth sweet tannins and lively berry fruit acidity that flow into a clean slightly tannic cedar laced finish with some balsamic overtones. Quote pleasant, and will stand alone very convincingly. By comparison, the Barsaglina is more of a blending wine. Interesting, and brings to mind a Lagrein in its minerality. A fascinating experience, and this is something winemakers in other parts of Italy should also be doing, because there is tremendous undiscovered potential in the old vines that will be lost if they aren't evaluated before someone replants them with something from a nursery. The word Punset is a Piemontese term for a hilltop that pokes up through the winter mists, and aptly describes Marina Marcarini's winery, perched atop a steep hill across the valley from Neive, one of the three towns in the Barbaresco Appellation. She grew up watching her grandfather make the wines, as a hobby -- he was a builder -- and might have followed a completely different path had he and the cousin slated to take over the family business not both died suddenly in 1982: She didn't particularly like construction, but was next in line, so she decided to take over the winery instead and make a go of it. A daring leap for an 18-year old, but Marina is nothing if not determined, and Punset's reputation has grown steadily over the years. I tasted her wines, including a number of older bottles, this spring at Vinitaly, and was invited to a vertical she organized in the course of Alba Wines this May, which featured some of the same bottles. Rather than pick and choose notes, I have decided to post everything, because the setting and the wines tasted previously in the course of an event do have an influence upon one's perceptions and impressions of the wines tasted subsequently. At Vinitaly I was tasting at a table of her stand, immersed in the hubbub of a trade fair, and taking notes and chatting with her as she poured. Pale brassy gold with greenish highlights. The bouquet is fairly rich, with floral accents and some spice supported by vegetal notes and honeydew melon. Welcoming. On the palate it's fresh and fairly direct, with bright honeydew melon fruit that gains from some bitter overtones that flow into a clean bitter finish. Direct, a fairly simple wine that will drink well as an aperitif or with simple fish dishes, mild cheeses, or vegetable soups, and also has the wherewithal to work with white meats. In short, versatile and will work without hogging the limelight, and I'm not complaining. This is a Chardonnay; the bouquet is fairly direct, with white flowers and some fairly crisp fruit supported by smoky notes and spice. The palate is equally direct, with simple clean white fruit supported by moderate acidity that flows into a clean finish. It's the weakest of the wines Marina poured, but is pleasant in an unassuming key. Deep cherry ruby with cherry rim. The bouquet is lively, with bright cherry fruit supported by bitter almonds and some graphite shaving bitterness. Pleasant. On the palate it's a touch lighter than I expected, with bright cherry fruit supported by mineral acidity and bright brambly tannins that flow into a clean slightly bitter tannic finish. It reflects the vintage, with its summer rains, quite nicely -- the Italian word that comes to mind is acerba, which means sour but can also be applied to the blossoming beauty of a young teen -- and will drink well with succulent red meats. This Dolcetto is only made in better years, and is deep cherry ruby with cherry rim. Elegant bouquet with considerable red berry fruit supported by warmth and deft spice. Quite pleasant. On the palate it's full, with bright red berry fruit supported by clean acidity and ample tannins with the classic Dolcetto bitter undertones that flow into a clean tannic finish. A fine expression of the vintage, and will drink quite well with hearty pasta dishes or succulent grilled meats. Worth seeking out if you like Dolcetto. Deep almandine ruby with cherry rim. The bouquet is fairly rich, with acidity and raspberry fruit supported by warmth and some brambly notes. On the palate it's full, and fairly bright, with lively raspberry cherry fruit supported by clean bitter raspberry acidity that flows into a clean raspberry laced finish. A food wine that will drink well with all sorts of things, from succulent red meats to chicken pot pie, and will in any case go quickly. You may want a second bottle. This is a 70-30 blend of Dolcetto and Pinot Nero -- some of what the vine salesman told them was Chardonnay turned out to be Pinot -- and is delicate ruby with almandine rim. The bouquet is rich, with tart berry fruit supported by spice and vegetal notes mingled with some sea salt and bitter almonds. Deft, and has quite a bit to say. Intriguing, too. On the palate it's full and smooth with fairly intense red berry fruit supported by clean slightly brambly tannins that flow into a smooth finish. It's a touch dry, but pleasant, and will drink well with foods; I would drink it sooner than later to enjoy its freshness. Elegant garnet ruby with almandine rim. The bouquet is quite elegant, with rosa canina and deft green leather with underlying spice from grape. A great lot going on, and very young. On the palate it's full and rich with powerful red berry fruit supported by bright acidity and tart tannins that flow into a clean tannic finish. Again, it's very young, and though it will drink well now (assuming you don't mind committing infanticide) with succulent red meats or stews, it will benefit greatly from more time in bottle, another 5-10 years. Garnet ruby with almandine rim. The bouquet is delicate, with almost haunting greenish notes shot through with red berry fruit, spice and green leather. Youth too, and all in all a fine expression of 2001 that has a lot to say though it's like listening to a toddler. On the palate it's full, and quite rich, with smooth bright red berry fruit that has sour cherry overtones and is supported by brisk tannins that flow into a clean bright finish. Classic Nebbiolo di Langa and quite elegant; it is worth seeking out but needs time, and will really begin to shine in 8-10 years. Almandine ruby with pale almandine rim. The bouquet is fresh, and very young, with floral accents and spice mingled with some greenish notes. Young, but promises well in a fairly alcoholic hot weather key. On the palate it's full and bright, with considerable warmth and some greenish notes mingling with red berry fruit that does have some strident notes, and flows into a clean finish. It's not as balanced as better years, but in its defense is quite young. This is a vineyard selection, and there's a story behind the bottles: Marina used to bottle everything in bottiglie bordolesi, the Bordeaux-shaped bottles, but decided to change to the Albeisa shape popular in Langa a few years ago. However, her Swiss importer asked her to continue to bottle Campo Quadro in the old bottles, so she did. The 2001 is deep garnet ruby with black reflections, and more charged than the regular Barbaresco. Its bouquet is rich, with deft spice and classic Nebbiolo rosa canina, and though it's quick to write one can swish and sniff at length. On the palate it's rich, with bright tart berry fruit supported by clean rich tannins that flow into a rich finish; the overall effect is quite nice in a very young key, and to be frank it needs time, because it's very much in mid stride. I would give it at least 5 years before opening it with succulent red meats, and expect it to age well for a further decade or more. Almandine with almandine rim. The bouquet is warmer than that of the 01, with spice and clean rich rosa canina mingled with cherries, and some greenish accents and alcohol that derive from the hot summer. On the palate it's full, and softer and less acidic than the 01, with bright cherry fruit supported smooth sweet tannins with some warmth that flow into a clean finish. It's an elegant expression of an over-the-top vintage. At Punset the setting was quite different: We were a group, and the wines were poured in flights, which gave us the opportunity to work back and forth, comparing the individual vintages. As is usually the case with tastings of this kind, after a brief introduction people tasted quietly, while taking notes, with commentary following. Marina's grandfather was making the wine then, and continued until his death in 1982. It's delicate almandine with brownish reflections and almandine rim heading towards orange. The bouquet is fairly intense, with balsamic notes, delicate spice, and savory accents with underlying leaf tobacco and some raw beef, coupled with acidity that keeps it very much alive. A lot going on and interesting to sniff. On the palate it's ample, and rich, with powerful brown sugar laced warmth supported by clean acidity and smooth sweet tannins with mineral accents that continue into a long warm finish. Quite nice, and has a lot to say; a fellow taster comments upon the way these wines drop fruit, but maintain acidity and minerality that continues at length, and can go on for years and years. Great depth and elegance. Marina's father was an amateur, and followed local tradition, which included the use of cherry rather than the oak used today, and very long fermentations. Simple push downs, not as advanced as today. They had relatively small casks, probably about 20 hectoliters. At least 2 years in wood, and it was bottled by 1978. The sweetness comes from the alcohol, which is 14.6 -- enough that you feel sweetness. Quite nice, and has a lot to say. Thos was a great vintage; it's brown almandine with almandine rim. The bouquet is rich, with green leather and acidity mingled with spice and some sea salt, with underlying balsamic overtones and savory accents. A lot going on, and quite elegant. On the palate it's rich, with full slightly sour berry fruit supported by clean warm acidity and smooth sweet tannins that have velvety accents and flow into a clean warm savory finish with deft acidity to keep it alive, and it goes on and on. Very nice, and is one of those wines one can have a long conversation with. Beautiful structure and great depth. This was the first vintage that they made Campo Quadro, but the bottles were ruined when the Tanaro flooded in 1994. Brownish almandine with brown reflections and almandine rim. The bouquet is fairly rich, with warm balsamic accents mingled with some green leather and leaf tobacco supported by considerable freshness and acidity, which is a common characteristic of the wines. On the palate it's full and rich, with bright berry fruit supported by deft acidity, and by smooth sweet tannins that have a velvery feel to them and flow into a clean rich finish. The 74 was more floral, perhaps, while the 1985 is much more powerful. They had hale with huge hailstones that smashed the vines they hit, but left others completely unscathed. Quite nice, and develops beautifully in the glass, though I found it a bit more direct than the 74. This is in part its being younger, and in part a difference in the vintage characteristics. But it is nice. Sweet soft finish, and still very much with us. About 15,000 bottles made here. 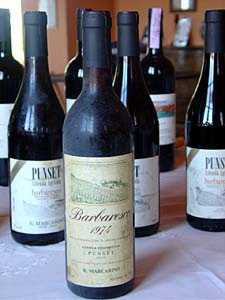 In 1993 they made 15,000, reduced after flood, and are now up to 25,000 bottles of Barbaresco. Almandine with brownish reflections and finish. The bouquet is rich, but not as rich as the 85, with spicy balsamic notes and bright acidity mingled with clean spice. On the palate it's ample and soft, with rich fruit supported by clean deft acidity and some spice that flows into a clean bright finish with tannic underpinning. It's pleasant, but not quite as smooth or as rich as the 85. But still has a great deal to say. Lively brownish almandine with brown reflections and brown almandine rim. The bouquet is rich, with balsamic notes and leaf tobacco mingled with warm spice that has some minty overtones and is supported by clean acidity that adds depth, while there are also savory hints of dried mushrooms. Quite a lot going on. On the palate it's a bit lighter than the others, with fairly rich sour cherry fruit supported by clean acidity and smooth velvety tannins laced with some sugars, and it all flows into a clean warm finish with some acidity. It's a lesser vintage, Marina says -- great burst of vegetation in the spring that led to green harvests, followed by hot summer and some problems with overripeness in the harvest, and a drastic drop in temperature after the harvest that made managing the fermentation dicey. It is elegant, in a slightly lighter key, and has held up vary well, with quite a bit to say. Marina thinks this peaked in 2003. Lively almandine with brownish reflections and almandine rim. The bouquet is rich, with fairly powerful floral accents and rosa canina mingled with sea salt and spice, and pleasant savory balsamic accents. It's more powerful than the 99. On the palate it's full, with powerful slightly savory berry fruit supported by clean sweet tannins that have clean savory accents, and velvety tannins. By comparison with the 99 the 98 is more fruity, and a little more direct, whereas the 99 has more complexity, and more facets to discover. Deep almandine with black reflections and almandine rim. She is selling this now. Bright bouquet with lively slightly greenish acidity supported by tart berry fruit, some greenish accents, and green leather. A lot going on and quite elegant. On the palate it's full, with powerful berry fruit supported by clean sweet tannins, while direction derives from clean acidity; there's considerable balance and it flows quite nicely into a clean finish with fruit and some tannic overtones that gains depth from acidity. Beautiful balance and depth, with great complexity, and it will develop very well with time; expect it to hold for a decade more. Almandine ruby with black reflections and almandine rim. The bouquet is fairly rich, with rosa canina and some underbrush mingled with saddle leather and some greenish accents. Quick to write, but a lot going on. On the palate it's ample and smooth, with deft cherry fruit, with warm slightly balsamic acidity and a fair degree of minerality supported by clean sweet tannins that have a slight burr to them, and flow into a clean rich berry fruit finish. Quite elegant, and though it is still a touch immature it shows great potential and it will evolve beautifully for a decade or more. Livley ruby. Elegant bouquet with lively red berry fruit supported by clean acidity and some greenish accents; it's quite fresh and surprisingly so for a hot vintage. On the palate it's ample, with rich fairly sweet red berry fruit supported by clean sour berry fruit acidity, and by smooth tannins that have a warm burr and flow into a clean fruit laced finish. It is quite nice, a surprisingly good wine for a 2003 say fellow journalists, and will drink quite well with succulent meats or light stews. Impressive for the vintage. Lively bright acidity and finesse even in a hot vintage! Deep black almandine ruby with black reflections and almandine rim. The bouquet is fairly intense, with cherry fruit laced with floral accents and underbrush, and wilder elements that are a factor of youth and will fade with time. On the palate it's ample and rich, with powerful cherry fruit supported by lively acidity and by clean tannins that have a warm youthful splintery burr that flows into a clean savory finish with tannic overtones. Quite elegant, though it needs at least a year and perhaps two to get its bearings, and more to come into its own. It will be very long lived. Deep almandine ruby with black reflections and almandine rim. The bouquet is rich, with berry fruit mingled with some cedar mingled with underbrush and bright acidity. Quite elegant, and one of those wines one can sniff and sniff again. On the palate it's full, and quite smooth, with rich cherry ftu that gains direction from lively strawberry acidity, and is supported by clean sweet tannins that flow into a clean strawberry acidity laced finish. Very young, but ready to drink, and one could, though it will reward those with the patience to give it a few more rears. Great depth and elegance. Lively almandine with black reflections. The bouquet is fairly rich, with sweet berry fruit supported by spice and some cocoa, with pleasant greenish vegetal overtones. On the palate it's rich, with bright ripe berry fruit supported by clean spicy tannins that are supported by clean deft acidity, and flow into a clean warm berry fruit finish with some citrus accents. It has delightful freshness, which is unusual for 2003 -- Marina thinks low temperature fermentation at temperatures of less than 30 C are important for maintaining freshness -- with considerable grace as well. Very elegant, and has a great deal to say; it will age nicely for many years. Most impressive for a 2003. Deep black cherry ruby with black reflections and almandine rim. The bouquet is very young, and has some sulfur that will blow off with time; shaking the wine clears this, and red berry fruit emerges mingles with some spice and deft acidity; there's great finesse, more than in the basic Barbaresco, and this is true in general with the Campo Quadro with respect to the Barbaresco. On the palate it's full, rich, and quite smooth with powerful red berry fruit supported by clean rich fruit, and the finish is clean and long with berry fruit that gains definition from acidity, with support from tannins. Quite nice, and will drink very well with foods. Winding down, my impressions from the Alba Wines tasting, which is again in flights, but a very different atmosphere from a vertical: You know you will be tasting 80-90 wines in the course of the day, and therefore work through them faster than you might in a less structured setting. The resulting notes tend to be more cursory, at least for me, and I also tend to be more critical than I am in a more relaxed setting, especially as fatigue sets in. Black almandine with black reflections. The bouquet is a bit wild, with animal tang -- horse stable straw -- mingled with underbrush and a fair amount of acidity. On the palate it's full, with bright tart cherry fruit supported by bitter accents and ample tannins that flow into a clean bitter finish with savory overtones. If you like fairly aggressive (in youth), traditional wines, you will enjoy it, but you have to like this style. It will work well with succulent red meats, and do interesting things with time. Deep almandine ruby with Moroccan leather reflections and almandine rim. The bouquet is fairly rich, with bright sour berry fruit supported by greenish accents and some vegetal notes. Traditional. On the palate it's full, with bright sour cherry acidity and sour berry fruit supported by moderately intense tannins that have a youthful greenish Nebbiolo burr to them and flow into a warm tannic finish. It's quite traditional, and if you like the style you will enjoy it; expect it to become lacy with time too, improving considerably over the next 10-15 years. Bottom line? Fine wines. and, having said all this, if you want more information on Punset, Marina has a fine website. Yes, already -- this has been a very strange year, with the mildest winter and spring since people began taking records more than a century ago: No snow, few frosts, and day-time temperatures in the 50s and 60s F (10-20 C) for much of the time. It was so mild that the vegetative cycle began quite early, especially in the north, where the vines emerged from dormancy at least a month ahead of schedule. Since then the cycle has followed its normal path, and now the vines in much of the north have reached the stage they usually reach at the end of August: The white grapes are ripe, as are the preconscious reds, and people are either actively harvesting or getting ready to do so; yesterday's TV news showed footage of people in the Oltrepo Pavese clipping bunches of grapes. Interestingly enough, some parts of the south are less far along than the north, perhaps because the southern varietals took the milder than normal conditions in stride and followed a more typical growing cycle. The quality of the harvest? People are quite optimistic: Though we did have a couple of torrid weeks early on, in May, and a couple of very hot weeks in July, this has been a less extreme summer, with brilliantly clear hot days, cool nighttime temperatures, and sufficient rainfall to prevent drought stress. Getting down to what I can report personally, Central Tuscany, which does get hot -- Florence consistently registers some of the hottest summer temperatures in Italy -- has had daytime temperatures in the mid-high 30s (low-mid 90s F), and night time temperatures in the low 20s (low 70s F). Ideal conditions for ripening, but not overripening, while the good temperature excursions will produce good bouquets. The bunches I see on the vines as I drive home look ripe, and if conditions continue I expect to see harvesters here too soon. Bottom line: If the weather holds, 2007 should be rather nice. We won't know for sure until the grapes are in the cellar, but have reason to be cautiously optimistic. Moving in a very different direction, this week's New Yorker has an in-depth look at the Italian olive oil industry, which has long been bedeviled by fraud. It's not nice reading, but these are good things to know. It's probably quite obvious to anyone who reads what I write that though I can (and do) appreciate a well-made international-style wine, given the choice I prefer well-made traditional, or old-style wines. This is especially true for Barolo and Barbaresco, where the new or modernist current carried things to extremes in the 1990s, aiming for concentrations and color that could rival those of new-world reds, coupled with ready drinkability from the time of release, or pretty close to it. To obtain the color and the concentration the modernists had to extract as much as possible from the grapes, and to do this they employed what are called rotofermentatori orizzontali, horizontal fermentation drums that almost look like they could come from giant washing machines: The must goes into the drum, which slowly rotates, thus eliminating the need for pushdowns or pumpovers, while the seeds, which settle to the bottom of the tank, drop into an underlying tray. With the seeds, and the greener, harsher tannins they contain out of the way, the winemaker sees to extracting as much as possible from the must in the tank, jacking the temperature up to 36-37 degrees. This is enough to draw most everything from the skins, while the fermentation runs its course in just a few days. The new wine is inky purple, but if left to its own devices will rapidly shed the color - color extracted this way is inherently unstable. Unless the wine goes into small oak, which releases substances that interact with and fix the color, and therefore those who use rotofermentatori at high temperatures are then obligated to put the wine into barriques, where it acquires the smooth oaky overtones of bouquet and fruit, firmly controlled acidity, and smooth velvety sweet tannins that are hallmarks of the new style. To be frank, new-style Barolo and Barbaresco are much more approachable when young than traditional Barolo and Barbaresco, which are fermented for longer periods at lower temperatures, in tanks that do not drop the seeds out; the newly fermented wines generally then go into botti, large oak casks that allow micro-oxygenation but have much less impact upon the wine they contain. Upon release the tannins of the traditional wines tend to be much more aggressive than those of the new-style wines, there's considerably more acidity, and the fruit is usually nowhere near as lush. However, with time the traditional style Barolo matures, the tannins smoothing and becoming velvety while the fruit becomes gracefully ethereal, the acidity helps maintain longevity, and the transformations can continue for decades. The new style Barolo and Barbaresco? The first great vintages to be made with the innovative techniques were the 88, 89 and 90, and in the early 1990s they garnered considerable praise and acclaim from the wine press. However, by the middle of the decade there were worried mutterings about how well the wines were holding up, and by the end of the decade many were falling apart -- just as the traditionally made wines of the same vintages were beginning to come into their own. Commenting upon the situation a few years ago, a well-respected American colleague remarked to me that he thought the modern style and its proponents were the worst thing that had ever happened to Piemontese winemaking. I filed his comment away for further thought, and the opportunity presented itself this year during an afternoon tasting held in Barbaresco in the course of Alba Wines. Among the producers was Rocche dei Manzoni, whose rotofermentatori greatly impressed me when I visited them in 1997, as did their bariccaia; I'm certain I've seen greater numbers of barriques in one place since then, but it struck me as palatial at the time. And I much liked the wines, which were quite international in style. Deep almandine ruby with almandine rim. The bouquet is fairly rich, with earthy notes and underbrush mingled with balsam and savory accents; the impression is big, almost hulking. On the palate it's ample, and quite smooth, with full rich berry fruit supported by clean slightly leathery tannins and moderate acidity that flows into a clean lengthy tannic finish with moderate acidity to keep it up. Though it is elegant, I got the impression that it had peaked, and was in the holding pattern that precedes decline; if I had a bottle I would therefore drink it sooner rather than later. Almandine ruby. The bouquet is fairly rich, with leathery accents and some leaf tobacco mingled with spice; the overall impression is fairly direct, with not as much finesse as I'd have hoped for. On the palate it's ample, and smooth, with fairly rich leathery berry fruit supported by clean velvety tannins with some leaf tobacco overtones that also have savory accents, and flows into a clean tannic finish. It's elegant, and though its being not as rich as the 97 wasn't a surprise, I had hoped that the less charged nature of the wine would have allowed greater finesse to emerge with time. It doesn't seem to, however, and I again got the impression that it had peaked. Lively ruby with ruby rim. The bouquet is delicate and fairly rich, with berry fruit supported by pleasant acidity and some smoky accents, and by comparison with the 1997 it's much more alive. On the palate it's ample, with fairly rich berry fruit supported by smooth sweet tannins that have leather accents and flow into a clean tannic finish that's fairly smooth. It displays considerable grace, but again isn't quite as refined as I might have expected form a 1999, it gives an impression of having been polished and buffed smooth, and this has flattened it. It's not failing, but I think it has gone as far as it will. Taken as a group these were obviously very fine wines upon release, but with the passage of time they have begin to stumble in a way one simply wouldn't expect from Barolo, a wine renowned for its ability to age, after just 10 years. Of the three the 99 has held the best, both because it is youngest and because the 99 vintage, by comparison with the 98 and 97, is more elegant and yielded wines that display greater depth and finesse. Lively garnet ruby with black reflections. The bouquet is powerful, with leaf tobacco and deft acidity mingled with rosa canina and some underlying berry fruit; though it's quick to write there's a lot going on, and one could swish and sniff it at length. On the palate it's full and rich, with direction of the fruit, berry fruit with some hints of goudron, coming from bright acidity, while the tannins are fairly sweet, and clean, with a warm burr that flows into a long bright clean finish. It displays great vitality and considerable depth, and is also very young, bringing to mind a teen who has grown enough that one can anticipate the nice picture the future will hold, but needs to finish developing. Most impressive. Put simply, I find the modernist or international style Barolo and Barbaresco of the 90s to be rather like the hare engaged in the race with the tortoise: It was quick out of the blocks and more approachable at the outset -- smoother and less skittish. By comparison, a freshly released traditional wine was (and is) a bundle of nerves, and, like someone who is having a bad day, is best left alone. However, like the tortoise, it advances steadily towards maturity, and by the time a decade has gone by -- this isn't a race, and therefore there's no finish line -- it has surpassed the international style wine, and from that point on they're on divergent paths, one still climbing while the other slowly begins to descend. Since I think Barolo and Barbaresco really become interesting with time, this is why I prefer wines made in the traditional style: They have the endurance necessary to go the distance. And to be quite honest, I think producers of the modernist school have reached the same conclusion; I found considerably less extraction and oak in the more recent vintages of many producers who were standard bearers for the modernist movement a decade ago. Some of their wines, in fact, now seem quite traditional. Bottom line: if you collect Barolo or Barbaresco and have bottles from the great vintages of the late 80s-90s (88, 89, 90, 96, 97, 98, 99), you should consider drinking them if they are from producers of the international or modernist school, especially the older bottles. If you instead have bottles from traditional producers, the early ones will be ready, though they can also age longer, while the more recent vintages will be just beginning to blossom, and will richly reward those with the patience to wait for them to reach maturity.